March Madness passed the $1 billion ad revenue mark in 2012, making it the highest grossing sporting showcase of all time. In 2014, Football playoffs and Super Bowl Generated $1.102 billion on ad revenue. March Madness generated $1.152 billion. The NCAA Basketball tournament turns casual sports fans into basketball junkies for a few weeks every year. According to the National Restaurant Association, 20% of consumers are likely to watch college basketball at restaurants or bars in 2015. Over 125 million people went to a local bar or restaurant to catch March Madness games last year. For bars and restaurants with multiple TVs this is your best opportunity all year to draw in new customers. Even if your restaurant wouldn’t usually be confused with a sports bar, this is still a golden opportunity to pick up additional business. One in four men said they’d go to a bar to watch at lunch. It’s a fantastic opportunity to get extra people in your door during late March and early April! Will they be watching it at your bar or restaurant? It’s critical to make it clear to your current customers early on that your bar or restaurant is committed to the whole March Madness tournament. Start including references to important games and tournament selection in your Facebook and Twitter posts. Make it clear you’re following the building excitement along with the fans and you’re likely to get more traction as you start dropping mentions of specials you’ll be offering during the games. Social media is an easy way to have potential customers begin associating your bar or restaurant with a place they can go to watch the tournament. Since your bar or restaurant probably won’t be adding new flat screen TVs in time for opening tip-off March 17th, you’re stuck with the TV situation you currently have. The key is optimizing the experience for customers. The 1st question is how will people know you have March Madness on the TVs at your Bar or Restaurant? The first step is as easy as hanging banners or posters that say “March Madness Lives Here”. 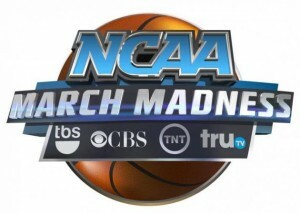 The DIRECTV MVP Marketing program for bars and restaurants has many free and deeply discounted marketing materials for March Madness available. Start talking about the tournament, contests and events you will be having at your bar or restaurant, and specials on your social media, email and other advertising. With the DIRECTV Sports Bar Finder App, every bar or restaurant that features DIRECTV is listed. A quick glance at the app and potential customers know you have DIRECTV and will be showing the games they want to see. Start promoting March Madness related specials, bracket pools and other events on your social media and email blasts. Over the first two weekends there will be instances where as many four games are being played simultaneously on different channels. Make sure you have a firm handle on your satellite schedule and ensure at least one employee is always able to handle customer requests for games. DIRECTV SportsFix makes this easy by giving you a calendar of every sporting event on DIRECTV. SportsFix is available for all DIRECTV bar and restaurant customers via email or through our custom advertising and merchandise site. There are definite ways to take advantage of the hype surrounding the NCAA Basketball tournament. If there is one constant that bar and restaurant owners can take away from March Madness, it’s that people will be flocking to bars and lounges across the country in order to watch the games. Your business can differentiate itself from your competition and capitalize on this phenomenon by developing a March Madness themed marketing campaign. Have a Selection Sunday Party at your Bar or Restaurant. The start of March Madness is not the first tip-off, its seeing if your favorite team will get in and where it will be seeded in the tournament pools. Feature regional drink specials and encourage fans to wear their teams apparel with specials. Tournament pools are to March Madness what Fantasy Football is to the NFL. Fans closely follow the tournament’s bracket and 100 million will enjoy filling out their own brackets to make predictions on the winners and to compete with other fans. Increase engagement with your customers by creating daily, online, and full-fledged tournament brackets. This can be one of the most effective ways to reach out to March Madness fans. Holding a March Madness contest with prizes and specials is a great way to engage fans and customers and grow an audience. Make sure you have brackets posted prominently in your restaurant. Have your wait staff ask your customers about their brackets and engage them about their favorite teams. Have specials focused on match ups and bracket names – First 4, Sweet Sixteen, Elite 8, Final 4. If you have a restaurant, consider offering patrons a free appetizer if they still hold winning brackets. This will keep them coming in even after the event is over! Social media should be used as an integral piece of your March Madness Marketing strategy. With over 50% of fans participating in social media daily, this is a low-budget way to draw in customers. Create a tournament pool on your Facebook page. Post content on Twitter, Facebook and Instagram encouraging fans to come in to see specific games and for specials. Update your Facebook page daily during the tournament to announce bracket activity and related promotions. Picking one team and promoting them throughout the tournament can be an easy way to turn your Bar into a “Team HQ”. Fans will flock to your bar to watch the games with fellow fans. Giving specials for wearing team apparel, giving away team related swag and hosting contests such as best team related costume can increase customer engagement. In larger bars you can separate areas of your bar for multiple teams. A local or regional team’s participation in the tournament is a great opportunity to market to local fans. Consider tying sales and promotions with the team’s games and offer specials if they win. Encourage fans to wear team colors or clothing to your events by offering specials related to team apparel and use these colors in your business ads. Target fans in your local advertising and use social media campaigns to generate interest. With email lists, you can blast out promotional messages daily and update fans on the brackets. You can even automate much of this so that your social media posts are automatically sent out as an email. 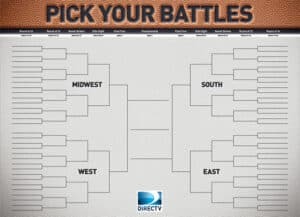 DIRECTV gives you the best value in TV and every game of the NCAA Basketball Tournament is available in all of its business packages Select and above. March Madness is an incredible opportunity to bring in new customers and DIRECTV MVP Marketing program provides FREE and extremely low cost marketing materials to help promote the tournament in your bar or restaurant. Banners, Posters, Bracket Wall Clings, Coasters and more are available to help you market the tournament on-site. In addition, The DIRECTV SportsFix gives you a calendar of all the games and the DIRECTV Sports Bar Finder app used by 10 million iPhone and Android phone users for instant access to all the bars and restaurants that will have the games. March Madness turns casual sports fans into basketball junkies for a three weeks every year. Everyone you know has a bracket or is cheering for their alma mater or local team. More people watch the NCAA basketball tournament at bars and restaurants than any other event all year. One in four men said they will go to a bar to watch at lunch. The question is, Will they be watching it at your bar or restaurant?